Is the DISCLOSE Act sneaking up in Lame Duck Congress? Lobbying organizations dedicated to curbing political speech rights today renewed an effort to convince Senators to vote for a third time on a modified version of the DISCLOSE Act, a misguided campaign finance bill. It's unclear if the Senate will vote on the DISCLOSE Act again in the already packed post-election session, but the updated version would reportedly strip out provisions of the bill that explicitly ban political advocacy. "For months, self-styled reformers claimed that the DISCLOSE Act was simply about disclosure. Now, forced to strip out the most explicit speech prohibitions in the bill, they disingenuously insist what remains is ‘disclosure only,'" said Center for Competitive Politics Chairman Bradley A. Smith, a former FEC Chairman. "Nonetheless, groups spanning the political spectrum—from the ACLU to the U.S. Chamber of Commerce—have blasted the bill's heavy-handed and poorly-drafted disclosure and disclaimer provisions as unconstitutional restrictions." Assuming Senate leaders simply remove the provisions of the DISCLOSE Act banning campaign expenditures of many government contractors and U.S. subsidiaries, the remaining disclosure and disclaimer provisions still substantially restrict and deter political speech. "In unveiling the DISCLOSE Act, Sen. Chuck Schumer touted the fact that the excessive disclosure and disclaimer requirements would deter political speech," said CCP President Sean Parnell. "Whatever cosmetic changes are being considered will not change the bill's effective suppression of the voices 'reform' lobbyists wish to mute." The pro-regulation lobby often stresses part of the Supreme Court's opinion endorsing disclosure in Citizens United v. Federal Election Commission, the January decision that lifted government prohibitions on the independent political speech of advocacy groups, businesses and unions. But the Court's opinion merely reaffirmed past decisions highlighting certain benefits of disclosure. The Court has ruled in other cases that certain limits restrict the government's ability to force private, independent groups to reveal their member and donor lists, and the broad disclosure and disclaimer scheme in the DISCLOSE Act would be constitutionally suspect. The drawbacks to onerous disclosure have long been noted by leading campaign finance experts: "Since few aspiring censors will admit openly to their purposes, the appeal to ‘disclosure' has given them the moral authority, in public argument, that they need," prominent Democratic lawyer Bob Bauer wrote on his now-defunct blog in 2007 (Bauer now serves as White House counsel; the administration supports the bill). "This is because ‘disclosure' is a regulatory tool; it is meant to serve the government's purposes, not only or even primarily those of individual citizens in need of information... This is a large part of disclosure's work: to force outcomes, not principally to inform free voter choice." Senate leaders and pro-regulation groups have reportedly called for passage of the DISCLOSE Act without § 101 and 102 of Title I, which would have banned the political speech of government contractors and U.S. subsidiaries, respectively. Major remaining provisions would restrict political speech directly and indirectly. The DISCLOSE Act would regulate a great deal of previously-protected issue advocacy as election-related speech subject to more stringent regulation and sweeping up grassroots advocacy on legislation months before elections. Congress has no basis to order the FEC to investigate coordination so broadly. Regulating grassroots lobbying ads as coordinated communications raises constitutional problems. For example, ads asking citizens to call and tell a Senator seeking reelection to oppose filibusters would be a covered communication under DISCLOSE, yet this is the same content that gave the Supreme Court pause in its 2007 Wisconsin Right to Life opinion. Such ads are "genuine issue advocacy," not election advertising. Congress may not treat them as election-related advertising under the First Amendment. The bill would also unfairly regulate any republication of a candidate's campaign materials as a contribution to that candidate's campaign, whether or not the group actually coordinated the ad with candidate's campaign. This section would make the standard for proving coordination extremely difficult between candidates and their party committees while leaving in place a far easier standard for proving coordination between candidates and outside groups. This provision is either a covert attempt to make it easier for party lawyers to file frivolous coordination complaints against independent groups or a ham-handed attempt to even the footing between parties and upstart groups. Instead, Congress should simply remove the McCain-Feingold restrictions on party coordination to allow parties to effectively coordinate with candidates (especially considering parties must raise regulated, limited funds, there's virtually no legitimate argument that this could corrupt either parties or candidates). DISCLOSE would dramatically expand the amount of regulated political speech by expanding the time frame for "electioneering communications." BCRA, which relied on extensive congressional fact-findings, defined "electioneering communications" as limited to broadcast ads run 30 days before a primary or 60 days before a general election. DISCLOSE would significantly expand this limited window to cover ads mentioning a candidate from any time starting 120 days before the general election. Congress has established no record for the proposition that ads run 120 days-four months!-before the general election are not "true issue ads." Indeed, the record of DISCLOSE includes puffy platitudes rather than any sort of factual or academic analysis. DISCLOSE would impose duplicative and vague disclosure burdens. Campaign finance law already requires the reporting of independent expenditures above $250 and contributions for the purpose of funding independent expenditures above $200. Similarly, expenditures of and contributions for electioneering communications over $1,000 must be disclosed. Furthermore, 527 organizations, regulated by the IRS, must disclose all contributions and expenditures of over $1,000. DISCLOSE would infringe on the rights of private association recognized by the Supreme Court in NAACP v. Alabama by threatening to disclose all donors to a group regardless of whether the donor intended to have their donation used for independent expenditures or electioneering communications. "Contributions of any size to political communications that are wholly independent of any candidate for office have not been shown to contribute to official corruption. Accordingly, disclosure of such donations serves no legitimate public purpose," the American Civil Liberties Union recently explained in a letter opposing the DISCLOSE Act. "Unfortunately, the DISCLOSE Act would wipe away such donor anonymity—most notably, that of small donors to smaller and more controversial organizations, even when those donors have nothing to do with that organization's political speech." DISCLOSE would impose draconian disclosure burdens on donations made from one organization to another, including those not made with the intent of supporting independent expenditures. However, DISCLOSE would exempt many transfers among affiliate organizations, principally benefiting labor unions. DISCLOSE includes a "NRA exemption" that removes only a handful of large, well-established 501(c)(4) organizations from certain disclosure requirements. Exempting these favored groups from the burdensome disclosure requirements creates a two-tiered system of favored and disfavored speakers, and will only serve to hinder genuine grassroots and local political movements that lack access to expensive campaign finance attorneys. This provision is likely unconstitutional. The Citizens United decision reaffirmed the right of corporations and unions to engage in independent expenditures using general treasury funds. The intent of this legislation is to circumvent that ruling. Lacking the ability to do so directly, it tries to stifle it as much as possible with a completely unworkable "separate fund" option. The legislative language allows for corporations and unions to set up separate accounts from which to make political expenditures and heavily regulates what must be disclosed from the money transferred to that fund. If a corporation chooses to accept this alternative, it must make expenditures from only that fund-forever. The result of this provision is to force corporations, including many tax-exempt organizations, to choose between two options that have each been found unconstitutional by the Supreme Court. These groups can either disclose all members and donors, a requirement that the Court ruled was unconstitutional in NAACP v. Alabama, or restrict political spending to a "Campaign-Related Activity Account," a type of PAC and thus an impediment the Supreme Court held in Citizens United could not be constitutionally imposed on a group making independent expenditures. The DISCLOSE Act would impose disclaimer requirements on broadcast ads that would be comical were it not for the extreme burden on free speech imposed. The requirements could effectively cut in half the amount a group could say in a 30-second ad, demonstrating an extreme hostility to independent speech. [Again, large, nationally prominent 501(c)(4) groups such as the Sierra Club would be exempt]. DISCLOSE would force a group's leader to make a "Stand By Your Ad" (SBYA) statement. Current law already requires a verbal disclaimer for independent ads. No valid informational purpose would be served by replacing this simple disclaimer with two bulky disclaimers. The disclaimers would be "so burdensome they would either drown out the intended message or discourage groups from speaking out at all," the ACLU noted. Citizens and organizations would be forced to engage in government-required speech, and a very real possibility exists that donors to organizations would be forced to state publically that they "approve" of a particular commercial when in fact they may have little interest or may even oppose the particular expenditure. This is because the bill does not limit identification of "major funders" to those who give or were solicited to support independent expenditures, but also includes persons or groups that give to an organization's general treasury. Unlike the voluntary SBYA disclaimers for candidates (which came with the incentive of lower ad rates) created by McCain-Feingold, the SBYA disclaimers in the DISCLOSE Act would be mandatory and would likely face constitutional challenge as government dictation of a speaker's message. The judicial review rules proposed in the DISCLOSE Act fail to follow the precedent set in McCain-Feingold, which allowed for expedited review and shortened the time between the filing of a suit alleging that enforcement of the act was in violation of constitutional rights and a final judgment on the issue by the courts. Even with the expedited schedule for challenges to BCRA, many groups were forced to wait years before having their right to speak vindicated by the courts. Citizens United, of course, wished to speak during the early part of 2008, but did not get a final ruling until January of 2010, well after the opportunity to speak had expired. The lack oxpedited appeal, combined with jurisdictional requirements that make it difficult for smaller groups to challenge the Act, seem tailor-made for those seeking partisan advantage and facing potentially difficult election cycles in 2012 and beyond. The Center for Competitive Politics is a nonpartisan, nonprofit group dedicated to protecting First Amendment political rights. CCP seeks to promote the political marketplace of ideas through research, litigation and advocacy. 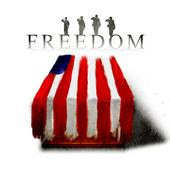 H/T & thanks to NotATypicalPatriot for filming the NEORSD Public Meeting on November 17, 2010. This was one of the public meetings hosted by the Northeast Ohio Regional Sewer District (NEORSD) regarding the proposed 300% Sewer Rate Increase for 63 communities in the N/E Ohio area. This tax is being forcefully imposed on the residents by the NEORSD to pay for EPA mandated upgrades under the proposed $3 Billion Clean Lake Project for compliance with the Clean Water Act. This particular sewer rate increase is separate & above the proposed Storm Sewer Tax being sought by the NEORSD. Join us and several other Tea Party & Liberty groups in supporting Middleburg Hts Mayor & NEORSD Board Member Gary Starr request that a 1yr moratorium be put in place on any sewer rate increase. For our Action Alerts on contact info and who to call please click the following; Action Alert 1 / Action Alert 2. We have all pledged allegiance to the flag of the United States of America. But what is a flag? It is mere thread, stitching and colored dye. It is a mere symbol. What we are pledging allegiance to is the Republic! The Republic, for which the flag once stood. John Adams wrote, “A republic is an empire of laws, not men.” A republic’s ruler is the law; its ruler is the rule of law. And no law is more supreme in this land than the U.S. Constitution; its subjects are princes and paupers alike. Yet we have elected representatives to our federal government whose first official act of office is to lie. They place their hand upon the holy bible, and make the most sacred of oaths to defend the Constitution against all foes, both foreign and domestic. Yet they turn around, almost immediately, and break it. They are the domestic foes. If the tea party movement is to be about anything, it must be about restoring the Republic; it must be about reestablishing the Constitution as the supreme law of the land. But here forth lies our challenge: We must be as willing to oppose unconstitutional legislation or action rooted in conservative ideology, as we are willing to oppose unconstitutional legislation or action rooted in liberal ideology. If not, we are no better than they are. If not, the Constitution will continue to be relegated to a mere relic, and we shall forever be an empire of men, not law. A handful of federal lawmakers are invested in one of the companies behind the controversial full-body scanning machines now in more than 60 U.S. airports. The individual investments are worth thousands, and in some cases tens or hundreds of thousands, of dollars. According to a Center for Responsive Politics review of the most recent personal financial disclosure filings, eight members of Congress -- three Democrats and five Republicans -- owned at least $2,000 worth of stock in L-3 Communications, which is one of the two main contractors involved in the full-body scanning machines. Sen. John Kerry (D-Mass.) disclosed possessing the most stock in L-3 Communications -- with a minimum investment of at least $500,000 and a maximum value of $1 million. The L-3 Communications stock is fully owned by his wife, Teresa Heinz, according to federal financial disclosure reports. Members of Congress file annual personal financial disclosures detailing their assets and liabilities, as well as those of their spouses and dependent children. These forms also allow lawmakers to describe the value of their holdings and debts in broad ranges, so it's impossible to know exactly how much the holdings of Kerry's family, or any other lawmaker's household, are worth. Republican Reps. Michael Castle (R-Del.) and Michael McCaul (R-Texas) both disclosed possessing between $16,002 and $65,000 worth of L-3 Communications stock in 2009. And Rep. Judy Biggert (R-Ill.) was the member of Congress with the next most valuable holdings in L-3 Communications, worth between $15,001 and $50,000. Here is a table of all eight lawmakers whose 2009 personal financial disclosure forms, which were filed in May, noted holdings in L-3 Communications, along with the minimum and maximum value of these holdings, according to the Center's research. The government's investment in full-body scanners has broadened since the "underwear bomber's" failed terrorism attempt last Christmas. Days later, L-3 Communications was awarded a $165 million contract for the machines, and another company, RapiScan, was also awarded a $173 million contract. Both companies have seen significant jumps in their federal lobbying expenses since just a few years ago, and both are employing officials with well-heeled government connections, as OpenSecrets Blog previously reported. Buying tech stocks with no consideration of price fueled the .com bubble. Buying real estate with no consideration of price fueled the housing bubble. 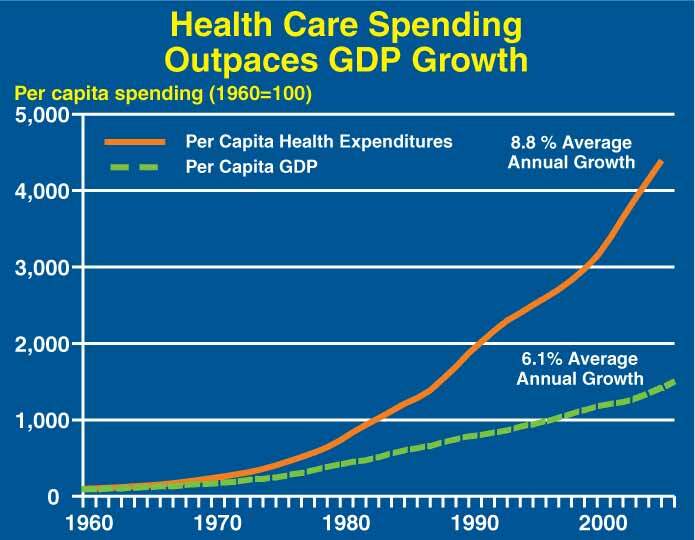 Buying healthcare with no consideration of price is fueling the bubble no one is talking about. People generally prefer their salary in the form of dollars, not goods or services. They want to be paid in cash, not in toilet paper, oil changes or Hamburger Helper. Given this, why do employees receive healthcare benefits from their employers? Our federal tax code allows for employer-provided healthcare benefits to be tax-exempt. In other words, you don’t have to pay taxes on healthcare if your job provides it, but you do if you buy healthcare on your own. This tax policy alters the natural preference to be paid in salary, to instead be paid in healthcare. 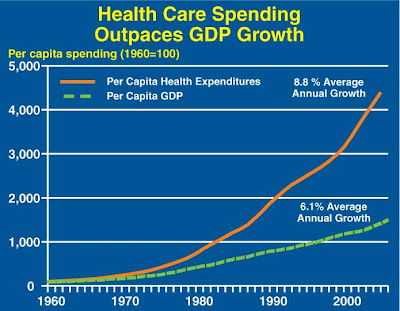 What we get from our employers is called health ‘insurance,’ but it is anything but. Insurance is defined as “the equitable transfer of the risk of a loss from one entity to another, in exchange for a premium.” Common examples that fit this definition are homeowner’s insurance, which pays out in the event of fire, and car insurance, which pays out in the event of an accident. Yet health insurance pays for everything from routine doctors visits to Viagra. This is not a transfer of risk in exchange for paying a premium; it is a third party buying your healthcare so you don’t have to pay taxes on it. While this allows healthcare consumers to purchase their healthcare tax free, it has the unintended consequence of stripping price signals from the patient’s decision-making process. This turns health insurance into the equivalent of an all-you-can-eat buffet where consumers gorge themselves with no consideration of cost. When was the last time you selected a doctor based on price? What about a prescription drug? Do you even know what the real prices of these things are? How does this translate into a bubble? Let’s put all the pieces together. The bubble is blown like this: Our tax structure creates the incentive for people to get as much of their healthcare through employer-provided benefits; with people getting as much of their healthcare through employer-provided benefits, consumers do not price shop their healthcare services; with consumers not price shopping their healthcare services, there is no sensitivity to rising prices; with no sensitivity to rising prices, prices spiral out of control; with prices spiraling out of control, a system is created that is completely artificial, exorbitantly expensive, and not built on market forces. This is a bubble. All bubbles burst. It is not a matter of if, but when. The bubble will burst like this: As healthcare continues to become more and more expensive, employers will no longer be able to afford to provide their employees benefits; with employers no longer able to provide their employees benefits, less people will have their healthcare paid for by a third party; with less people having their healthcare paid for by a third party, there will be more consumers responding to price signals in the healthcare market; with more consumers responding to price signals in the healthcare market, the existing system will begin to crack due to the infiltration of market forces; with the infiltration of market forces, America's healthcare system will be shown to be wholly uneconomic and will collapse on itself. In Part 1 of this Stop the Sewer Rate Increase Action Alert (click here to read) the contact information for the NEORSD Sewer Board members & EPA are listed. Please continue contacting the Board members and the EPA with your concerns about the proposed sewer rate increase, the lack of transparency in the process & the complete disregard of public accountability shown by the NEORSD Board members. You can also click here to leave comments on the NEORSD website. Joining the Village of Macedonia, City of Middleburg Hts, City of Lyndhurst, and the City of Broadview Hts. -- the City of Strongsville has also passed a Resolution supporting the 1yr Moratorium. Please contact the Mayor & Council of your city and request they do the same. Click here to find the contact information for the 63 communities serviced by the NEORSD. Our immediate task at hand is to have the Sewer Board pass a 1yr Moratorium on the propsoed increase. This starting to gain traction and currently more cities are taking the steps of passing Resolutions supporting the request for a 1yr Moratorium. Besides expressing disgust over the NEORSD Board members actions, State Senator Tim Grendell & State Senator Tom Patton have also joined us in requesting a 1yr Moratorium. Please contact the below elected and 'elect' officials and request they also stand for the people and support the 1yr Moratorium. When contacting the below officials with this initial request we encourage you to be cordial in expressing your concerns. Officials expressing the willingness to join us & support the 1yr Moratorium can email their public statement of support to clevelandteaparty@gmail.com. Note: To make emailing easier at the end of the contact info for the below OH Reps & OH Senators their email addresses have been listed together so you can cut, copy & paste them into your email browser. At the Northeast Ohio Regional Sewer District (NEORSD) public hearing this past Wednesday night nearly 250-300 people showed up to voice their displeasure's over the proposed sewer rate increase. Other than Julius Ciaccia (NEORSD Executive Director), the only NEORSD Board Members present were Middleburg Hts Mayor Gary Starr & Ron Sulik. After hearing comments from citizens & Tea Party members from across the District, when asked if he would support the moratorium on the rate increase -- Mr. Sulik "was still undecided." Whereas, Mayor Starr was a "star" in speaking out against this gross abuse of power by the NEORSD & the U.S. EPA and requested a 1yr moratorium on these increases that will cause an increase in your sewer bill to more than $50 a month by 2016 and eventually to more than $140 per month. The increase to fund the $3 Billion Clean Lake Project is over, above & separate from the additional Storm Water Management Fees the NEORSD is also seeking to impose on behalf of the U.S. EPA & the Clean Water Act. The NEORSD will vote on this rate increase at 12:30pm on December 2, 2010. In a NEORSD meeting held today, Mayor Starr made a motion to re-schedule the time of this meeting at 7:00pm so it would afford the public the availability to attend this meeting. NOT ONE BOARD MEMBER WOULD SECOND THE MOTION! In fact, NEORSD Board President Darnell Brown found Mayor Starr's Motion -- out of order! By not attending the public hearing & then by the refusing to even Second a Motion rescheduling the vote at a time where it can be witnessed by the very public they wish impose a tax on by federal edict, shows the board members of the NEORSD, a court-created regulatory & taxing agency created on behalf of the EPA for enforcement of the Clean Water Act (ORC 6119), could care a less about the further hardships their vote will cause on this already financially & economically distressed region. Our first steps are getting the moratorium in place -- Please contact the NEORSD Board members and voice your opinion on the increases and request the meeting be reset for 7pm and, the 1yr moratorium be put in place. Please read entire post for complete list of people to contact. When contacting your Mayor & Council express your dismay they were not present at the NEORSD meeting last night representing your community. Ask them if their absence meant they don't care about the increases or does their absence mean they support them? Mayor Starr of Middleburg Hts has contacted all 63 communities in the NEORSD and has requested they sign on to a statement supporting the request for a moratorium on the rate increase. To date the cities that have signed on in support are; Village of Macedonia, City of Lyndhurst, City of Broadview Hts. Most likely your Mayor and/or Council member will tell you they have no authority over the NEORSD and there is nothing they can do. They are to stand and fight against anything that negatively affects the residents & city they represent. Should they not come out publicly against this draconian sewer rate increase -- you will remember this when it is time for their re-election. County Councilman-Elect Dave Greenspan, Middleburg Hts Councilman-at-Large Ray Guttman & Middleburg Hts Ward 4 Councilman John Grech & former Congressman Ron Mottl were the ONLY other public officials in attendance. They have no authority over the NEORSD either - but they were there standing with the residents against this sewer rate increase. Congratulations to these elected officials for doing the right thing! And why weren't the elected officials of your city present? Call and find out -- ask that they also support the moratorium. 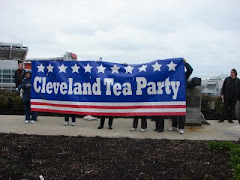 Email us back at clevelandteaparty@gmail.com and we will make their answers and responses public. Click here for more on some recent EPA actions. 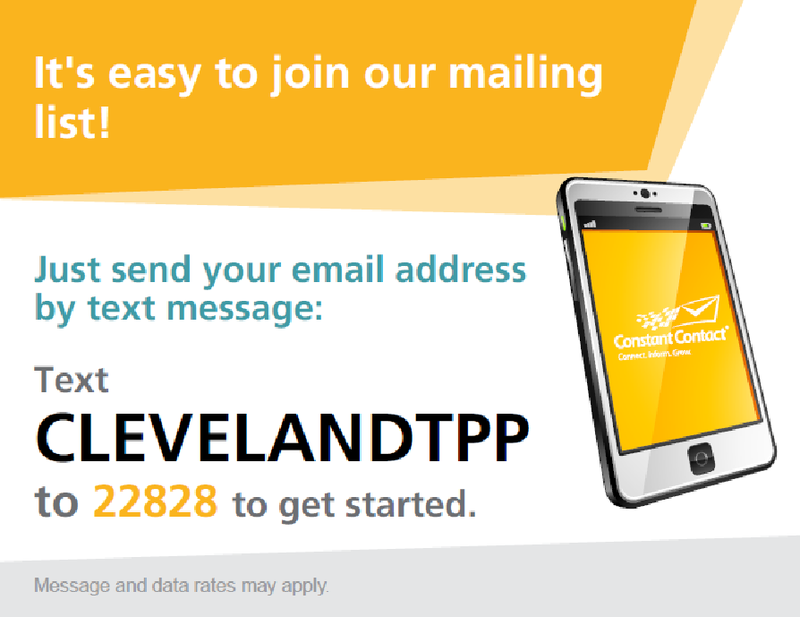 Please continue checking back for more contact information or join our email list by signing up at www.clevelandteaparty.com for updates. Tea Party Patriots "Freshmen Orientation" a Smashing Success! (West Palm Beach, FL) South Florida Tea Party Leaders and over 200 tea party leaders from 31 states met in Washington, DC with Freshmen Congressmen and develop an "action plan". This is the largest meeting of local tea party leaders ever. Since July, a Tea Party Patriots, nationally the largest and original tea party group, has been working with its over 3,000 local tea party leaders coordinators to meet with incoming Congressmen for a "Tea Party Orientation." In addition to the "Freshmen Orientation," local tea party leaders spent a day sharing best practices, brainstorming, and voting on items for their action plan. In a true bottom up grassroots organization format, all tea party leaders were given equal rights on voting. "We heard from excellent speakers and found ourselves in the company of some of the cleverest people in the movement. It was a pleasure to spend the weekend with such a high caliber of tea party activists. The tea party movement is in very good hands." Andrew Ian Dodge, Tea Party Patriots Maine Coordinator. John Stahl of the Berks Tea Party.org in PA said, " A wonderful experience! We were able to let new Congress people know what we want them to do to restore America. We have our work cut out for us. They now know who we are and what we can do, Giving them our agenda, allows for a dialogue while at the same time, we get them on board with our basic principles." "I am excited about the ideas that came out of the meeting," Everett Wilkinson, Florida State Coordinator and Chairman of South Florida Tea Party. "We met with several Freshmen and let them know that we will be there for them. I also feel very confident that the tea party is going to be here 4 years and 40 years from now!" There has been much debate within the Tea Party movement about the Senate proposal to ban all earmarks. While this may not be our "hill" to die on, there is no doubt that we must make this stand against earmarks if we are to stop or change the culture in D.C.
House Democrats have reached a deal to keep both Reps. Steny Hoyer and James Clyburn in the leadership, with Hoyer (D-Md.) serving as minority whip and Clyburn (D-S.C) taking a new, as-yet-still-undefined number three position. Speaker Nancy Pelosi (D-Calf.) who is seeking the minority leader's job in the next Congress, reached an agreement with Clyburn on late Friday night, and Democratic leaders quickly announced the deal. Clyburn singled out Republican Govs. Mark Sanford of South Carolina, Rick Perry of Texas, Bobby Jindal of Louisiana and Haley Barbour of Mississippi. So what does all this mean? It means, with the House Democrats electing more of the same type of 'leaders' that have led to the decline of the United States -- it shows they have not learned their lesson and we will have our work cut out for us over the next two years. Congressman John Boehner (R-West Chester) filed a legal brief today backing the growing state legal revolt against the job-killing health care law, which Boehner -- a former small businessman -- and other Republicans have warned will continue to cost our economy jobs unless it is repealed and replaced. Boehner’s brief supports a lawsuit filed by 20 state attorneys general and the National Federation of Independent Businesses (NFIB), the nation’s largest small business association. Boehner’s brief requests leave from the trial judge to file an amicus brief challenging the constitutionality of the ‘individual mandate’ at the heart of the job-killing health care law. In August, primary voters in Missouri rejected the mandate by a nearly 2.5-to-1 margin. Two months prior to that, House Democrats voted to reject a GOP proposal to repeal the mandate. Earlier this week, Senate Republican Leader Mitch McConnell (R-KY) announced his intent to file a brief backing the states’ lawsuit. Now that Mike DeWine will be State Attorney General for OH we fully expect him to fulfill his campaign promise of having OH join these lawsuits against Obama Care. Lawsuits against Obama Care is how this over reaching government intrusion in our life will be stopped. So the burden of funding these mandates can be passed on to the already cash-strapped states. Much like the federal government & the EPA is doing with bypassing legislation for Cap & Trade and in effect enacting it through regulation. So along with State Attorney General elect Mike DeWine promise of initiating legal proceedings against Obama Care & now that OH has turned 'red' our newly elected State Legislature should proceed with supporting the PCCOH's efforts for a State Sovereignty Amendment to the OH Constitution or begin crafting legislation to this effect. Our three branches of government, Executive, Legislative & Judicial, have a built in checks and balance system. The check & balance on the federal government is the states -- this is what makes our state sovereignty rights so vitally important in this fight against not only Obama Care, but illegal immigration, any Cap & Trade legislation and, any attempts of over-reaching regulation by federal entities under directives or mandates from the Executive Office in violation of our State Constitution. 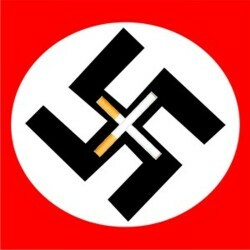 Cigarette Nazi's at it AGAIN! leadership at the U.S. Department of Health and Human Services (HHS) and the U.S. Food and Drug Administration (FDA) for its bold new effort announced today to dramatically reduce the number of American lives lost annually to tobacco-related disease. Still the number one preventable cause of death, tobacco continues to claim more than 400,000 lives each year in the United States. Today’s announcement included a proposed rule, Required Warnings for Cigarette Packages and Advertisements, requiring more prominent warnings to better communicate the deadly effects of tobacco. As Secretary Sebelius shared with us today, anyone who picks up a pack of cigarettes will soon clearly understand the risk that comes with smoking. Placing prominent color photos and warning statements will hopefully help young smokers make more informed decisions about lighting up, and give current smokers a renewed commitment to quit their addiction for good. I wonder if this means they will put a picture of Nancy Pelosi's face on the door of all plastic surgeon offices? Co-Chairs of the National Commission on Fiscal Responsibility & Reform, former Sen. Alan Simpson and Bill Clintons ex Chief of Staff Erskine Bowles, released their bipartisan plan for reducing federal spending and deficits. Needless to say, many of the "feed at the federal trough" entitlement groups were less than thrilled spitless. The co-chairs’ proposal makes clear that they are serious about leaving no budgetary stone unturned. While many sacred cows were put up for sacrifice, some remain. And just as no one likes to see their tax dollars wasted, no one likes to see their favorite program on the chopping block. Policymakers and interest groups across the spectrum are already leaping to attack almost every proposed reform. To overcome opposition the proposals cannot simply be aspirational instead of implementable and projected savings need to be real and realistic. But political challenges should not deter the Commission and Congress as we move ahead. This is a great starting place for the commission’s work. These proposals challenge the Commission and Congress to make the kind of hard decisions it is going to need to make if there is any hope of putting the government’s finances on a more sustainable path. We cannot afford to squander this opportunity to rid the budget of ineffective and wasteful spending – from energy and agriculture subsidies to wasteful defense spending practices – and put the country in a better position to face the challenges ahead, whether from global economic shocks or threats from terrorism. We are less convinced savings from Defense Secretary Robert Gates’ proposed Pentagon reforms should be applied toward deficit reduction. Laudable as the reforms are, we’re unsure the methods he’s outlined will produce the savings he’s promised. Likewise with defense contracting reforms: Though we have long advocated for such steps, it’s difficult to measure just how much savings these reforms will produce and foolhardy to budget around it. Cultivating Cash As in today’s proposal, we have historically called for eliminating business tax expenditures, including the LIFO method of accounting and energy tax preferences for the oil and gas industry. We would go further to include loan guarantees to mature industries, like nuclear power, and eliminating other subsidies to energy companies. We applaud the Commission for taking on some sacred cows in its defense proposals. Budget-watchers agree Defense Department health care programs such as Tricare are in desperate need of reform despite political aversion to taking them on. We are also confident our military can absorb the suggested topline cuts in procurement and research & development without compromising our security. Taxpayers for Common Sense has also put out a list of Common Sense Reforms for the incoming 112th Congress that can read by clicking here.